Ford Canada CEO Mark Buzzell says he's looking at adding a pick-up and delivery service (already offered in the United States), while more features will be added to the brand's mobile app. 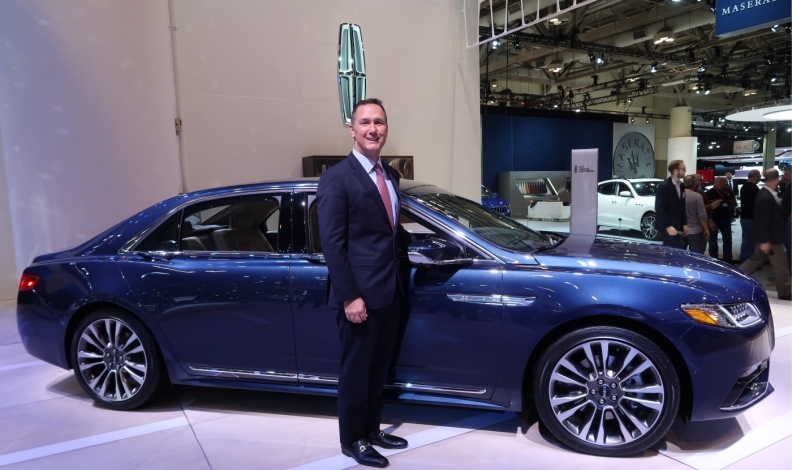 TORONTO — With four new models in the last four years, a global focus and an all-new Navigator going into production, Lincoln is ready to find a new and more youthful audience, says Ford of Canada President Mark Buzzell. “If you go back seven or eight years when the industry was in difficulty, we decided to fix the ‘blue oval’ first, so we made a lot of investments in Ford,” Buzzell said in an interview. Lincoln entered the market in China two years ago and now has 65 dealerships there. That, along with growing U.S. sales, is giving the brand the economies of scale it needs, Buzzell says. Lincoln buyers have traditionally been older, and Buzzell said he is focused on changing that. He’s looking at adding a pick-up and delivery service (already offered in the United States), while more features will be added to the brand’s mobile app, along with the possibility of working with affinity partners. At a media event before the 2017 Canadian International Auto Show in Toronto in February, most attendees were online influencers. The star of the show and subject of the night’s tweets was the Navigator Concept, the forerunner to the production version that will be built in Michigan and debut later this year. Some of that nontraditional advertising includes culinary experiences, experiential tours, and “Dream Dates” where potential customers testdrive a car for 48 hours and receive dinner at a restaurant, says Carole Wilson, product marketing manager for Lincoln Canada. The company wants younger buyers, but Wilson says it’s looking more at attitude than age. Navigator will be a big part of this, she said, as it already pulls in Lincoln’s youngest customers: around 48 years of age as opposed to the early 60s for the brand’s core products. Navigator also has the highest number of women buyers of all luxury utilities in its segment. “We don’t want to lose them, but we want also to attract that male head of the household with the new Navigator,” Wilson said. As the oldest product in the segment, the current Navigator ranked fourth in sales among competitors, behind the Cadillac Escalade, Lexus LX and Infiniti QX80. The company is now targeting social-media influencers, which it identifies through dealers or at auto shows. With culinary experiences proving popular, Lincoln is partnering with chefs and restaurants in its largest luxury markets. In Toronto, it’s working with the restaurant Fring’s, a colaboration of celebrity chef Susur Lee and rap star Drake, to reach out to the restaurant’s customers. “Once we get people in and experience the vehicle, they find it stands up well to our competitors and they’re amazed,” Wilson said.